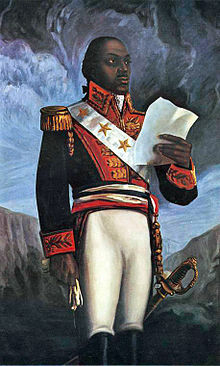 C. L. R. James The Black Jacobins: Toussaint L'Ouverture and the San Domingo Revolution, 1938. Laurent Dubois Avengers of the New World, 2005. Robert I. Rotberg Haiti: the politics of squalor 1971. Ian Thomson. 'Bonjour Blanc: A Journey Through Haiti' (London, 1992). A colourful, picaresque, historically- and politically-engaged travelogue; regular asides on L'Ouverture's career. エメ・セゼール Toussaint Louverture (Paris, 1981). Written by a prominent French thinker, this book is well written, well argued, and well researched. F. J. Pamphile de Lacroix - La révolution d'Haïti (1819, reprinted 1995). Memoirs of one of the French generals involved in fighting Toussaint. Surprizingly, he esteemed his rival and wrote a long, well-documented, and generally highly regarded history of the conflict.